The first new class of antidepressant drugs in more than three decades was approved in March when the U.S. Food and Drug Administration (FDA) fast-tracked esketamine, the chemical cousin of illegal street drug ketamine, to prescribe to patients with treatment-resistant depression. 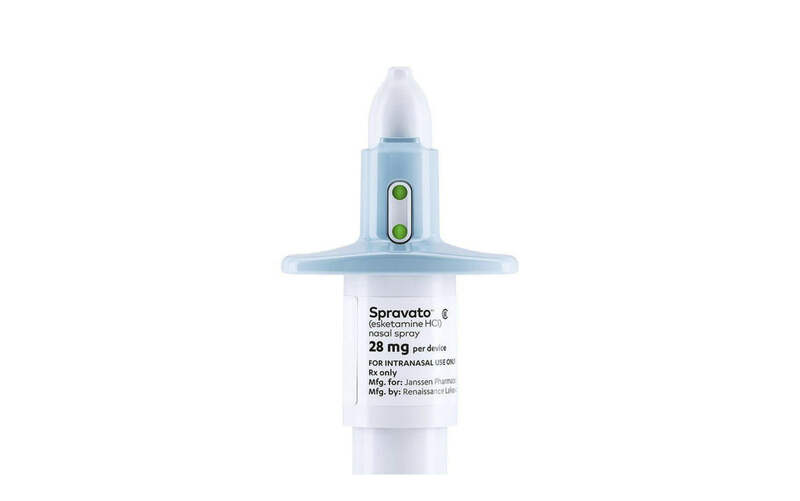 Developed by Johnson & Johnson’s subsidiary, Janssen Pharmaceuticals, esketamine is marketed under the name Spravato and dispensed as a nasal spray administered under the supervision of trained health care professionals. Ketamine is the chemical mixture of esketamine and arketamine, two mirror-image molecules. But when the molecules are separated, esketamine has been shown to be more potent. As a result, it requires a lower dosage and has a decreased risk of disassociation, tolerance and abuse. Treatment-resistant depression is common and there is a clear unmet need for fast-acting therapeutics. More than 16 million adults in the U.S. are affected by depression. While a variety of antidepressant medications help people, such as Prozac and Cymbalta, about one-third of patients don’t respond to treatment. Spravato is for patients who have tried but do not respond to at least two antidepressants. While all the other antidepressants on the market take two to three weeks to take effect, esketamine and ketamine work in a matter of hours. Still, the FDA requires anyone using Spravato to take a traditional oral antidepressant, as well. Esketamine’s long-term safety is not fully understood. While the company maintains the drug is “generally tolerable” for extended use, some experts think more research needs to be done. “I think there are a few gaps that need to be filled in terms of finding out the number of applications, how safe it is in the long term,” Machado-Vieira said. Ketamine was approved by the FDA in 1970 as a potent anesthetic for diagnostic and surgical procedures, but it wasn’t until recently that clinics across the country started offering ketamine infusions to treat pain and depression. Because ketamine has not been approved by the FDA to treat depression, infusions aren’t covered by insurance and can be costly. In Houston, patients pay out-of-pocket anywhere from $500 to $1,350 per ketamine infusion. Spravato ranges from $590 to $885 per treatment session. The first month’s induction phase consists of two treatments per week. After that, patients move into maintenance, during which they receive one treatment every week or every other week. Because Spravato has been approved by the FDA, it’s important to note the list prices don’t include insurance coverage, rebates or discounts. “It’s something we’ve all been waiting for,” Mathew said.